NYC, 02/28/2019, 6:00PM. Solo Flutist of the Vienna Philharmonic. Flutist Karl-Heinz Schütz has appeared at international festivals in Salzburg, Bregenz, Graz, Montpellier, Rheingau, Sapporoand Prague, among others. He has performed as soloist across Europe and Japan, with performances of the importantflute concertos with Wiener Philharmonikerand Symphoniker as well as NHK Tokyo and Sapporo symphony orchestra. Conductors such as Daniel Barenboim, Fabio Luisi, Yakov Kreizberg, Dmitrij Kitajenko and Bertrand de Billy invited him to be the soloist in their concerts. 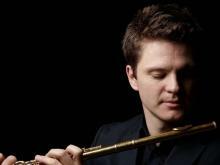 Currently he is Solo Flutist of the Vienna Philharmonic and Professor of Flute at the Music and Art University of Vienna.